Once abandoned and sentenced to death, then rescued and adopted, now life-savers themselves and beloved family members . . . this is the story of three former stray dogs, Noodles, Scout and Ioli. The book 'Nice Nosing You' by Elke Vogelsang is a declaration of love and gratitude to three Spanish rescue dogs who joined their new family, saved their owner’s life and changed their owners’ whole lives for the better. One year on Christmas Day, Elke’s dogs suddenly started barking outside the bathroom door. Investigating the commotion, Elke discovered Carsten, her husband, collapsed in the bathroom. He had suffered a major brain hemorrhage, and the dogs had in fact saved his life, discovering him at a crucial time. Yes, there are those stories out there with animals saving human lives. This is the story of three Spanish rescue dogs, once rescued from kill shelters in Spain. The months immediately following were filled with much uncertainty, and in an attempt to establish some sort of routine and as a diary for her husband missing out on family life, Elke started taking photos of their dogs to show Carsten in the hospital. As Carsten slowly recovered, Elke’s project became an obsession. The results of this project are shown in this collection of emotional dog portraits, which are captioned with inspiring quotes about life and dogs. Elke says about (her) dogs: “Dogs are funny characters. They find pleasure in the most mundane things. My dogs are my joy, recreation and constant source of laughter, though they can be shy and even melancholic as well and have also comforted me in bad times. They are indeed family, the kind of family members you love to have around and never get into trouble with, as they are unpretentious and forgiving. 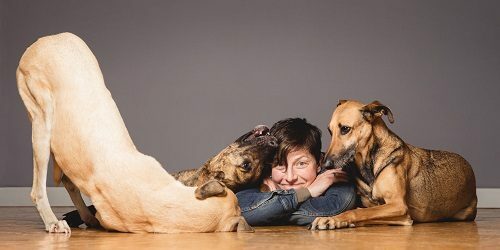 Praised by Good Morning America who said “people are going nuts over these photos”- and The Huffington Post who said “Elke Vogelsang has taken dog portraits to a new level”- this is truly a collection to treasure and we love how Elke's special trio have been immortalized in this wonderful book. Elke Vogelsang is a photographer specializing in animal portraits. She has a passion for creating unique, individual, and impressive pictures that always capture the essence of the moment and her subject. She lives with her husband and their three dogs in Hildesheim, Germany.